Apparently an era of entertainment is closing with the final movie in a very popular series. It’s called Harry Potter, perhaps you’ve heard of it. 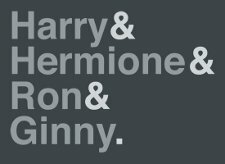 Anyways, this Harry & Hermione & Ron & Ginny T Shirt celebrates the four main heroes in the story. Isn’t it amazing how certain language constructions take hold and become something, like this particular listing convention with the ampersand symbols and groups of related people, things, whatever. Pretty cool, and this one celebrates an amazing series. J.K Rowling was certainly inspired. The novels were magnificent and the movies have been great as well. Snorg Tees puts together a great Harry Potter T Shirt just in time for the July 15 opening of the final movie.